While better known for its film and entertainment industry, if you scratch the surface of Los Angeles, you’ll find this star-lit city is underpinned by an impressive literary scene. Home to the likes of a wealth of lauded writers, from Joan Didion to Raymond Chandler to Charles Bukowski and Bret Easton Ellis, and with a bustling independent bookshop scene, while not an obvious choice for the bookworms among us, it has a plethora of hidden bookish hotspots. 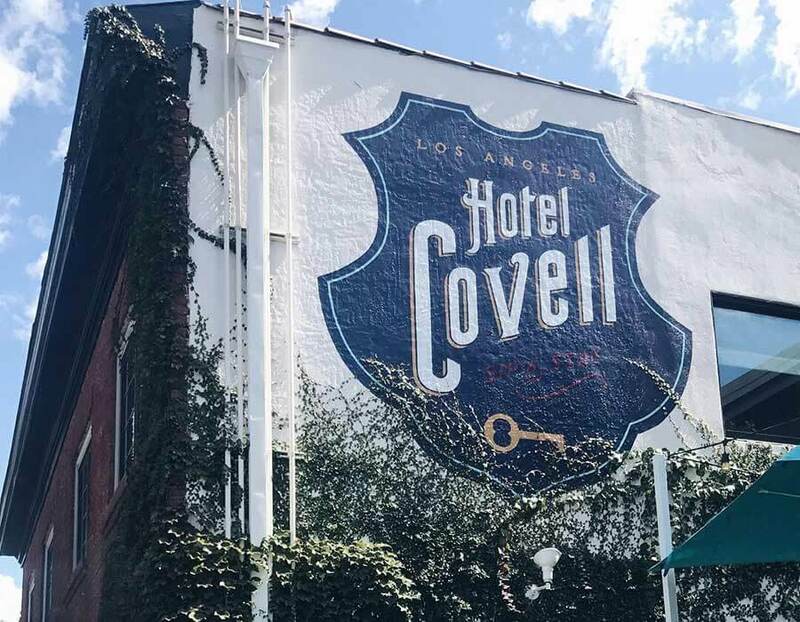 One such gem is Los Feliz’s Hotel Covell, where I was lucky enough to stay for a fleeting night while on a recent stay in LA. 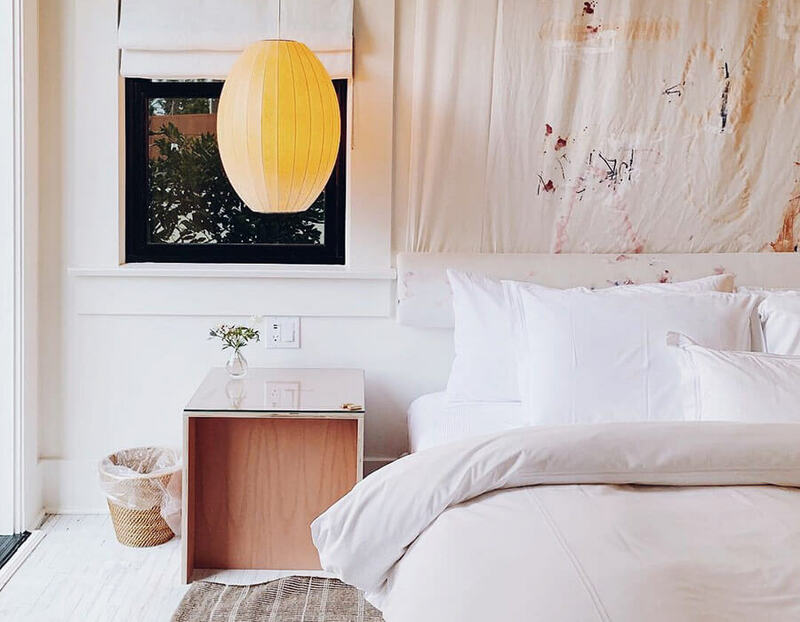 Located at the Los Feliz end of Hollywood Boulevard, Hotel Covell has an artsy, laid-back neighbourhood feel. Nestled away from the tourist hotspots of Los Angeles, while still being near enough for anyone wanting to visit the bright lights of the city, it’s flanked by both Griffith Park and the Hollywood Hills – perfect for any would-be walkers, and is also within easy reach of the famous Griffith Observatory. With an abundance of nearby watering holes, hips shops and cafes, guests wanting to experience real LA living are truly spoilt for choice. The hotel’s nine suites – or ‘chapters’ as they’re referred to – are designed to depict a chapter in globe-trotting author George Covell’s transatlantic travels. I stayed in Chapter Six, which had a studio apartment vibe, complete with kitchenette, balcony and beautifully plush bathroom. 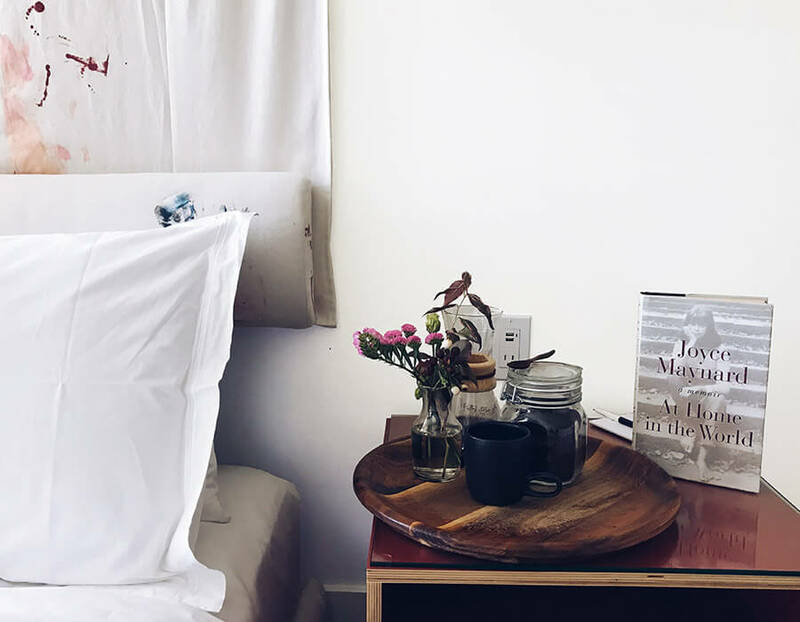 Stylish, bright and airy, with wooden floors, fashionable rugs and arty accessories, the king-sized canopy bed was the most comfortable bed I have ever slept in, and were the sun-drenched deck less inviting, I would have stayed under the covers until check-out time. As it were, the balocny offered the perfect place for a morning coffee, and the walk-in shower made for a decadent wake-up call. With a well-stocked Smeg fridge, fresh coffee and a great selection of bathroom treats, it’s the perfect place to retreat to after a faced-paced day in LA. Sadly, landing in LAX just after 10.30pm and facing a long wait to clear immigration, meant that I arrived too late to enjoy the hotel’s buzzing wine bar, but I made sure I popped my head inside before leaving for Venice the next day. Warm and rustic, Bar Covell is a popular hangout for Loz Feliz locals, and boasts one of the best wine lists in LA. With eight craft beers on offer and appetisers including flat bread pizzas and cheese boards, it’s a great late-night gathering spot for anyone staying at the hotel wanting to enjoy a tipple or two. When I first began looking into literary hotels in LA, I was somewhat baffled when I stumbled across Hotel Covell. Described by CN Traveler as a ’boutique hotel with a story to tell’, its nine suites are based on the author George Covell and the different ‘chapters’ of his life, starting as a boy in Oklahoma to a frugal author in 1950s New York City, to his glamorous Parisian stints in the 1960s. I spent more hours than I care to disclose searching online for George Covell – wondering why on earth it was that I had never previously heard of him or his work. 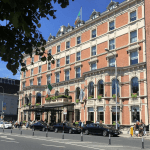 It was only when my Google searches repeatedly took me to the hotel’s website that it dawned on me that the author was – ironically – a fictional one. Conceptualised by interior designer Sally Breer, bon vivant writer George Covell’s imagined biography forms the basis of each of the hotel’s beautifully designed nine suits, and is stylish storytelling at its very best. 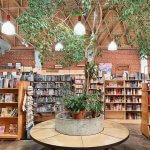 Just a short stroll away from Hotel Covell, you’ll find neighbourhood favourite Skylight Books. 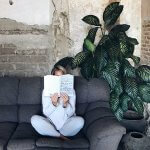 Boasting two branches – the smaller Arts Annexe that specialises in books on art, design and photography, and the main, larger shop, Skylight Books is the perfect place to peruse books for as little or as long as you like. And anyone wanting to up their neighbourhood knowledge will delight in the bookstore’s wide selection of books on the history of Los Angeles. 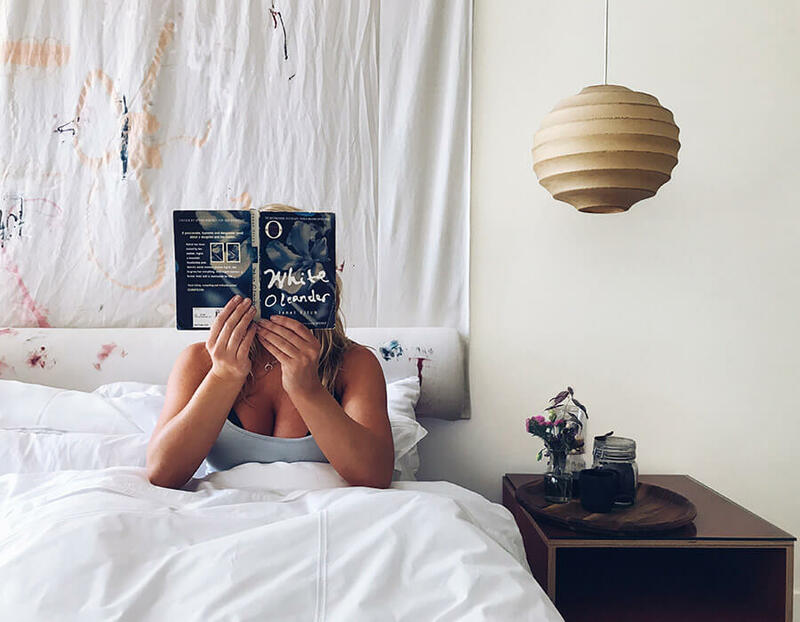 There is a wealth of literary offerings set in and around Los Angeles, so if you’re looking for a location-appropriate tome to curl up in bed with, you have endless books to choose from. I opted for Janet Fitch’s White Oleanda – a coming of age novel about Ingrid, a brilliant poet imprisoned for murder, and her daughter, Astrid, whose odyssey through a series of Los Angeles foster homes becomes a journey of self-discovery. One of the city’s most famous authors is Joan Didion, whose book Play it as it Lays is often hailed as a pinnacle LA novel. Described as a ruthless dissection of American life in the late 1960s, it is set in the heart of Hollywood and is cited as a book captures the mood of an entire generation in the sort of spare prose that blisters and haunts the reader. Finally, if you’re looking for something more along the lines of memoir, Hollywood Notebook by Wendy Oritz might be just the thing you’re after. A love letter to Los Angeles by one of its own, Hollywood Notebook is a poetic meditation on living and writing in this vast and varied city. Hotel Covell is conveniently located in the Los Feliz/East Hollywood area. They are situated between the bustling areas of Hollywood and Downtown Los Angeles, but far enough removed to still have a peaceful experience. Suites at Hotel Covell start at $315 per night.